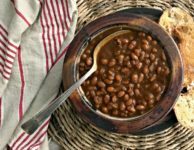 Instant Pot Baked Beans offer that authentic baked beans flavour and texture in no time at all. The instant pot, also known as an electric pressure cooker, is your friend if you love molasses baked beans. 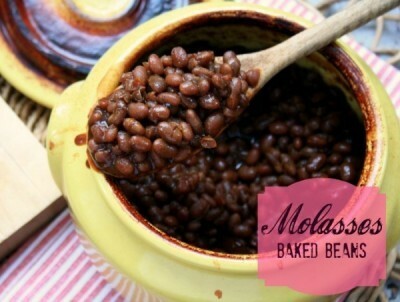 I love molasses baked beans but making them can be an all-day affair. 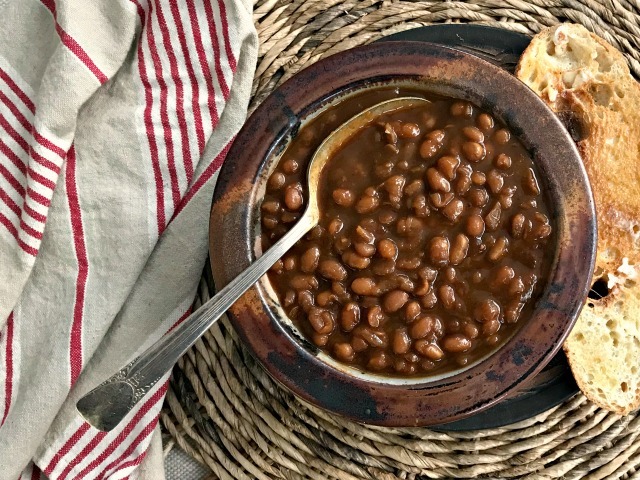 With an Instant Pot, you don’t have to soak your dried beans overnight. And you’re hours ahead of the game compared to the traditional method of all-day baking. Instead, you do a two-step cooking process using the Instant Pot. First, cook your dried beans with water (in the Instant Pot). Then, drain the cooked beans, put them back in the pot with molasses and the rest of the seasoning, and cook. That’s it. 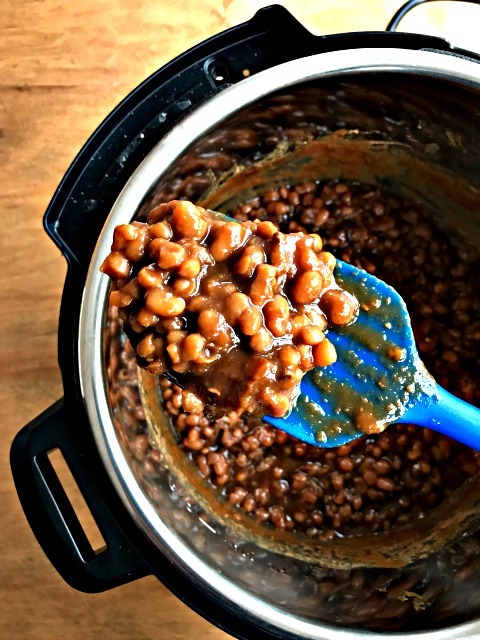 Another benefit of Instant Pot Molasses Baked Beans is that, if you find your beans a little too soupy when the cooking is done, you can use your pot’s sauté function to reduce the liquid and thicken them up. 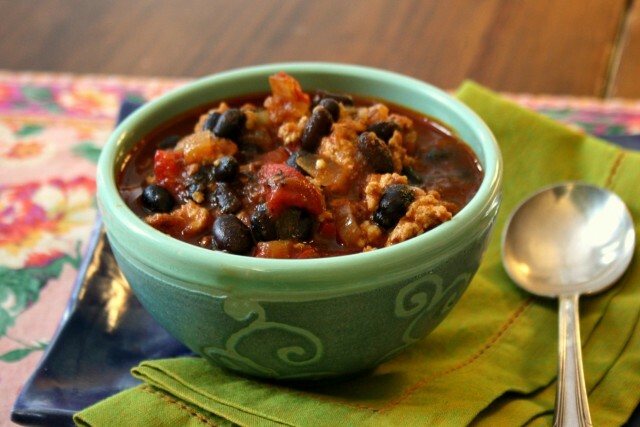 Tip: Want to make this recipe refined-sugar-free? Replace the brown sugar with fancy molasses. When I was little, my favourite part about eating baked beans on Saturday night was the hot dogs mom added in, and the oatmeal brown bread we ate alongside. I’m not sure when I aged into loving molasses baked beans but now they’re one of my favourite parts of a weekend breakfast. I freeze molasses baked beans in one-cup portions if we don’t get through a batch within a week. Place your dried beans in the instant pot and cover with an inch of water (about 4 cups). Secure the lid, turn the pot’s steam vent to close. On manual mode, set the timer for 15 minutes. While the beans are cooking, combine brown sugar, molasses, salt, dried mustard, Worcestershire, and black pepper in a bowl. Add two cups of boiling water and stir to combine. When the timer beeps, allow the pot to depressurize for about 20 minutes, press “cancel” and then carefully turn the steam vent to open and remove the lid. Drain the beans and return them to the pot. Place the onion and apple on the beans and pour molasses mixture over the beans. Secure the lid, turn the steam vent to close, and on manual mode, set the timer for 16 minutes. When the 16 minutes are up (timer beeps), allow your pot to depressurize another 20 minutes, turn steam vent to open and remove lid. If you’re beans are too runny, turn unit to saute mode and saute for 5-7 minutes, stirring from time to time. Do this receipt work on stove top as well?? I still soak the beans over night. And I dont have Instant electric pressure cooker. Hi Elizabeth, Are you accustomed to making beans on the stove top? If yes you can adapt this recipe. You’ll need more water for the first cooking and will need to keep an eye on liquid levels for the second cooking. Hello: You don’t mention the size of the Instant Pot for this recipe. It looks like a 6 Qt size. Can this recipe be halved for the 3 Qt size. Hi Sherilyn, Thanks for the reminder that I should be mentioning the pot size. Yes, it’s 6 Qt. I haven’t played with smaller pots so am not sure but you should get a good sense when you first cook the beans from dry. IF that works fine then step two should as well. I didn’t see an icon for printing the recipe I wanted so I just went to file and hit print. The problem is that it prints nine pages when I just required the one page with the recipe. This wastes paper and ink. I don’t need to print all that stuff.  would it be possible for you to make the recipe on one page which can be printed separate from pictures and other unnecessary info? Hi Linda, I’m so sorry about that. Our current print functionality is a pain so we have just added a new version that prints everything on one page. We’re just testing it on the website now and it should be up and running soon. Bit by bit we’re adding the nutritional analysis to our recipes. 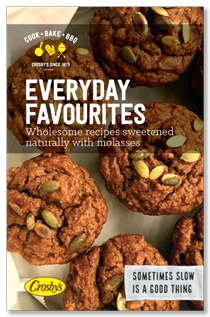 For now we’re focused on our healthy baking recipes but we will eventually get to savoury recipes too. How do you get 45 mins? When I was a kid, the hotdogs were the ONLY part of baked beans that I liked. Thankfully, my tastes have changed. I made this last night and it was enjoyed by all. I was concerned the combined cook-time was too long for the beans and that they would turn out like mush, but I needn’t have worried. Soft with a very slight firmness. Perfect. I was a bit confused by the onion and apple – I just peel/core and put them on top? No chopping? Both essentially disintegrated and I just stirred the bits in after cooking. Hi Kate, Glad I’m not the only one who preferred the hot dogs as a kid. I love your idea to add hot sauce so will try that next time I make this recipe. Tried this recipe out it is delicious 😊 ty very much. My new bean recipe, everyone loved them.